South Jinks Creek connects Tubbs Inlet with the Intracoastal Waterway, providing ocean access to property owners who live on the eastern end of Sunset Beach. SUNSET BEACH – The town is resubmitting its request for a permit to dredge a portion of Jinks Creek after state officials deemed the initial application incomplete. The North Carolina Division of Coastal Management, or DCM, informed the town in a letter in December that the application missed several pieces of information, including core sediment samples, clear identification of the dredge footprint, and separate descriptions of each area to be dredged. The state’s Dec. 21 notification pushes back the start of the town’s dredging project to the 2020 dredging season, which begins late fall/early winter of this year. Earlier this month, the town received a Coastal Area Management Act, or CAMA, major permit to dredge Mary’s Creek and Turtle Creek as part of a project that includes roughly 3 miles of waterway, feeder canals and finger canals. Jinks Creek continues to be a controversial part of the project because of environmental concerns. The Sunset Beach Town Council last year agreed to a compromise that resulted in the town pulling north Jinks Creek, which has never been dredged, from the town’s permit application. Jinks Creek connects Tubbs Inlet with the Intracoastal Waterway, providing ocean access to property owners who live on the eastern end of the Brunswick County island. There are more than 300 properties, including yet-to-be-developed lots within two new developments, along the canals proposed to be dredged. 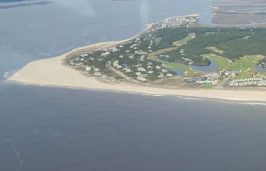 Shoaling has clogged the waterways along this area of the island, making it difficult for boaters to reach the Atlantic Ocean outside of a short window of opportunity that’s based on the tide, according to proponents of the dredging project. Jinks Creek is roughly a mile long. It is not designated a primary nursery area, or PNA, by the state, but the tidal marshes lining both side of the creek are. The North Carolina Marine Fisheries Commission designates PNAs to protect habitat, particularly along bottom areas, including sand, mud, sea grasses and oyster rocks. Dredging is restricted in PNAs and shoreline development to protect water quality and limit stormwater runoff. Mannon Gore, who purchased the barrier island in 1955, had south Jinks Creek dredged once more than 40 years ago to create the man-made canals. Ted Janes, who has owned a home in Sunset Beach for more than 30 years, is among a group of property owners who continue to raise questions about the potential environmental damage from dredging around north Jinks Creek. Janes said that because the permit application refers to the proposed work as “maintenance” dredging, it’s “misguided” because the southern part of the creek was dredged once decades ago. The permit application, completed by engineering consulting firm Moffitt & Nichol, states that when feeder and finger canals included in the proposed project were dredged in 2002, the work did not negatively affect north Jinks Creek. That, Janes said, is another mischaracterization, because the application omits what effect, if any, the 2002 dredging had on the remaining 1,750 feet of south Jinks Creek. “The town has spent a lot of money from the town’s treasury to get it to the point where they could put the permit in and (Moffatt & Nichol) left out some very, very basic information,” he said. Dr. Richard Hilderman, a Sunset Beach property owner, founding member of the Brunswick Environmental Action Team, or BEAT, and retired biochemist, has raised further concerns about dredging the creek in relation to sea level rise. That migration can’t happen around Sunset Beach, he warns, because those areas are blocked by development on the island and the mainland. Hilderman, former chair of the now defunct Sunset Beach Environment Resource Committee, makes the case that Jinks Creek is a PNA. Sampling conducted by Dr. Fritz Rohde, a scientist with the National Oceanic and Atmospheric Administration and member of a scoping committee selected to advise the town about the dredging project, “showed a comparable level of diversity in different species of fish, shrimps and crabs to the diversity of areas that have been designated PNAs,” according to Hilderman. Rohde could not be reached for comment. Those questions and other questions, Janes hopes, may be the ticket to taking off the table any possibility of dredging north Jinks Creek.